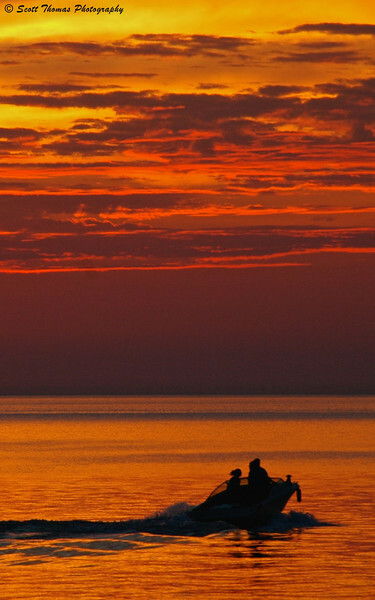 A boat going on an evening cruise on Lake Ontario at sunset. When looking through blogs and flickr photostreams, one can tell who are learning and who are the more experienced photographers. How? If you go through many posts or pages of photos and they are all in a Landscape orientation like the photo above. That’s a good indication the person is not thinking like an experienced photographer would. Portrait version of a boat going on an evening cruise on Lake Ontario at sunset. Remember, to look and see in both Landscape and Portrait orientations when you are out with your camera. Have fun! 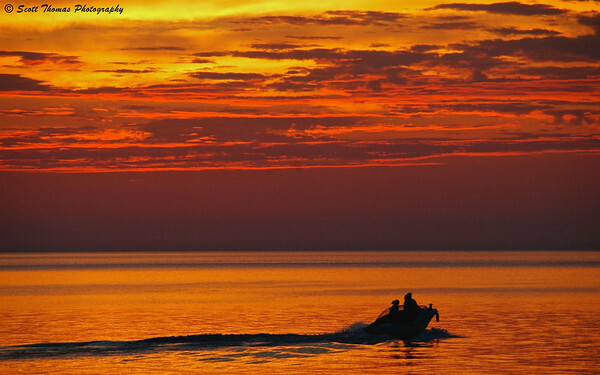 This entry was posted in Photography and tagged 18-200mm vr, boat, boating, lake, Lake Ontario, landscape, new york, nikon D70, orange, Photography, portrait, sunset, water. Bookmark the permalink. Love the fiery orange in both shots. I do turn my camera to portrait now and then, but I don’t often think to do it in a scene like this. Thanks for the tip. May I ask how much of that lovely color you were able to achieve with camera alone, and how much is post-processing? I have my camera setup to capture color. Especially in the red spectrum so the colors were enhanced when I clicked. Mother nature did put on a show that evening though and these colors are very representative of that show. In post, I just recovered the highlights, added definition and sharpening. Not much at all. Hmm… indeed. I knew this; however I haven’t practiced in this way in a good long time. Excellent reminder. I’ll keep this in mind the next time I’m out on a shoot. I really do like the 2nd portrait shot the best and definitely the two photos make your point. Gorgeous sunset… I love orange sunsets. Thank you, Anna. Yes, I find myself thinking Landscape more these days as I post most of my photos on the web and that is the best orientation. However, when I was reviewing a lot of my work recently, I noticed that trend. I want to get back to doing both orientations again. To write a post about it is a good way to keep it my head. Good point. I do this fairly often and am also surprised at the results fairly often. They are both beautiful Scott. I used to shoot 50-50 landscape and portrait format. But since most of the images posted on my blog are in landscape format so it has become the format I use the most. I have also tried to crop my images to the square format. It forces you to think different if you shoot with it in mind. Btw, I prefer the long dark wave in the landscape format, but that’s another subject. You’re doing better than most in your ratio than most, Carsten. I haven’t used the square crop much. I don’t see it readily but it is an interesting way of displaying a photo. With waves coming from watercraft, you can place them coming or going in a frame and still make it a pleasing composition. Good point, Scott. That’s one thing I learned early on – don’t be afraid to shoot in portrait or even with odd angles. Great shots, by the way, as well as the shot below of the man fishing. I have to tell my students this ALL the time. They even shoot portraits in landscape orientation! I try to do both and sometimes, often surprise myself when the orientation I was so sure was gonna be the best, turns out to be incorrect! That fiery sky is incredible! In this case, I do prefer the landscape shot simply because it shows more of that fantastic sky. Yep, next to telling someone to fill the frame, this is next on my list for instant ways to improve one’s photography. I haven’t seen this kind of sky since that night. Nature was being very creative that evening. I’ve never done much with the portrait orientation. I don’t think I have an eye for this way of shooting. I only use it when what I’m shooting is too large to fit within the landscape mode. Will have to give this some thought. I see by the pingback below you did give it some thought. Way to go, Preston! What a fantastic sky, and photo! To decide how to crop a photo (or hold the camera) demands in my oppinion a descision of what the photo is supposed to show. Your photos are telling two different stories; The landscape version is telling a story about the endless beauty of nature, the second version is telling me a story about the couple in the boat. In this case I prefer the first one, because it is fantastic to see how overwhelming beautiful nature can present a sundown. It must have been nice to be there in person! It was and so nice that I could capture it to show to others years later. That is a big part of changing the orientation. To tell a different story. What I am getting at is, if you don’t look, you might miss the second story. Always depends on the subject and background, which orientation works best, sometimes even a portrait looks best in landscape orientation than it would in portrait orientation. Like Tracy, I prefer the landscape here, BUT I would have moved the camera to the right, so the boat would be in the left 1/3 of the image (to make it look like the boat was racing INTO the frame, not OUT of the frame, like in your case). Ah, I have some that do that and are excellent photos. Reason why I like this version over those? It was evening and this boat was racing back to port before nightfall. At least, that is how I see it. The biggest reason why digital photography is so popular today. The time and expense of film. Though I (we?) make up for it in software, processing and gear. Seeing our images instantly is a great teacher. What an interesting thought! How utterly fascinating to think there are always two shots (well, probably lots more) within every scene. I hardly ever take the pics with the landscape orientation. Almost every pic has to be turned around in the photo editing. Don’t know that it’s any sign of advancement though. LOL! Love the colors in both your photos, Scott. The other variable is time…a scene changes over time. Some continuously while others change over hours, days, weeks or years. Time studies are fascinating to do and see. I think I have seen some of those photos on your blog but never put together like that. Awesome! Wow Scott! That is one amazingly warm-looking sunset.